This gently lilting lullaby weaves its way across the pages of the book, with no more than three lines per spread, encouraging the text to be read and digested slowly. The text speaks of love and togetherness, and how people complete each other, in language that could apply as much to a parent and child as to any pairing of friends or partners. The accompanying illustrations tell the tale of a mother, her two children and a dog, fleeing danger in a little boat, and drifting across the sea. They rescue a polar bear, also adrift, before finally finding land and a welcome. The illustrations, in watercolour with ink outlines, are tenderly whimsical, and slightly older readers will be able to make links to tales of refugees and displacement, as well as issues of global warming, among others, whilst babies and toddlers, and their parents, will be lulled by the gentle hues coupled with the tender words. Apparently, dragons are all in my imagination. That’s what Nina Willis said, anyway, on the Monday before the Monday before last. When a new kid named Nina arrives at school, Georgia soon learns that Nina doesn’t believe in dragons. Which makes Georgia sad, and a little bit cross, because her friend, Trouble is a dragon. Worse, though, when Trouble finds out someone doesn’t believe in him, he starts to change. Georgia needs to find a way to get Nina to believe. Trouble and the New Kid is the third story featuring trouble and Georgia, but sits well on its own for those new to the series. Georgia is a wonderful heroine, warm hearted, but often in trouble at school. Trouble, too, is fun and the concept behind the series is wonderful. Illustrated with greay scale illustrations by the whimsical Stephen Michael King, Trouble and the New Kid will appeal to junior primary aged readers and anyone who loves whimsy. It turns out that our school Principal doesn’t live in a cupboard at the end of the corridor next to the teachers/ staffroom, even though Kyle Watson and Braedon Smythe both say so, and they should know. They are always being sent to see the Principal. As for me, Georgia, I’ve never made it beyond talking to the Deputy before, and she usually comes up to the classroom. Georgia travels to school on the back of Trouble, a dragon. Trouble stole their house you see, and set it in the mountains. It was far easier for Georgia to get a lift to school than to try and set their house back on its block. But Trouble has been banned from school and the alternative ‘drop-off point’ is at the spot where their old house was. When Tibbles, the cat next door vanishes, Georgia is happy to help find him. She collects clues and eventually solves the mystery. Black and white illustrations appear on most openings. Trouble is a dragon, and just like an oversize puppy, he is enthusiastic and not really aware of his size. Georgia is full of enthusiasm too, and sometimes surprised when her attempts to help out are misinterpreted. Their adventures are great fun and will have readers giggling. Fans of Anna Fienberg and Kim Gamble’s ‘Tashi’ stories will enjoy these tales. Recommended for independent readers or read-to for younger children. ‘I did it! I’m really here!’ barked Fizz, as he stood outside Sunnyvale City Police Station on his first day of work. Is heart was beating fast. This was the day he’d been dreaming of. This was the day he would be a real undercover police dog. ‘Too chicken to go in, Powder Puff? Little loser!’ sneered Amadeus, bounding up the stairs. ‘Why don’t you go back to the dog shows where you belong? Leave the police work to the big boys. Fizz, undercover police dog arrives at Sunnyvale Police Station for his first day of work. The last thing he expects is to be assigned at a dog show – the very life he joined the police force to avoid. But he’s an undercover police dog and he’ll do the best job he can. Along with his undercover friend and colleague Remi, Fizz must masquerade as a competitor if they are to discover who is stealing jewels. There is a character page, contents list, and illustrations on every opening. Each named chapter includes a full page image giving hints to the content. 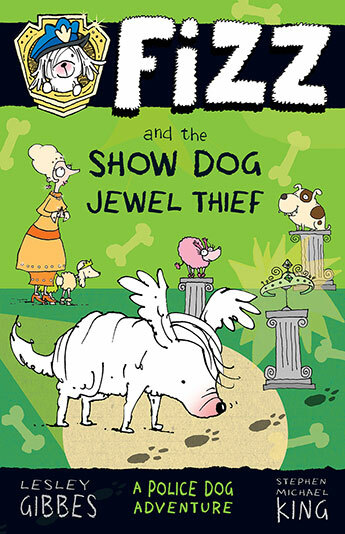 Fizz and the Show Dog Jewel Thief is the third instalment of a new series of early chapter books from Allen & Unwin. Fizz has been determined that he will make his own mark on the world beyond the show arena, despite the urgings of his parents. While he is not a stereotypical police dog, he finds his place in an undercover police dog squad. His attention to detail, clear thinking skills and persistence help him to succeed in solving mysteries. Along the way, he encounters many other dogs who have found their perfect jobs, despite not succeeding as police dogs. Young readers will enjoy all the adventure and mystery as well as the humour. Character pages, contents and chapter pages all add to the access for new readers discovering the magic of chapter books. Recommended for newly confident readers ready for a longer story. Fizz arrived for work at Sunnyvale City Police Station and straightaway smelled trouble. He’d never seen Sergeant Stern look so worried before. I’d like to speak to you in my office,’ said the sergeant. Remi and Amadeus were already sitting by the desk. Undercover police dogs have to keep their cool in all sorts of dangerous situations. And this time, it’s personal. Fizz is no stranger to the world of handbag dogs – his sister is the handbag dog for a famous actress, and is often seen at public events. Now, she is the third victim of the Handbag Dognapper. Fizz has to go undercover at the launch event of a new security collar. 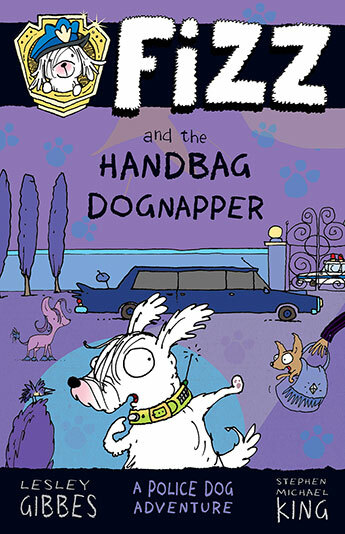 With the help of his undercover colleague, Remi, and regular police dog, Amadeus, Fizz has to discover who is stealing the handbag dogs and why. Early pages show the world where the mysteries take place and another spread introduces the characters who appear in this adventure. A contents page lists the named chapters and a full page illustration accompanies the start of every new chapter. Each opening includes illustrations. Fizz and the Handbag Dognapper is Book 4 in a new series of chapter books from Allen & Unwin’ from the perspective of Fizz, a newly-trained undercover police dog. Fizz may be small, but like many small dogs, he has enthusiasm and energy to spare. He’s gutsy and clear-thinking, resourceful and happy to accept the help of his colleagues. Beneath the adventure and the humour, there is also cooperation, tolerance, and fair play. Newly independent readers can check the character pages to keep track of the larger than normal cast and pause at each chapter to predict what is likely to happen next. Recommended for newly-independent readers ready for a slightly longer chapter book but not yet ready to tackle unillustrated text. Fizz knew exactly what job he wanted. ‘I want to be a police dog,’ he said, puffing out his chest. Fizz has all the right attributes for a police dog: he is brave; clever; and super-fast. There’s only one teensy tiny problem – Fizz doesn’t look like a police dog. He is ‘a small cute ball of white, fizzy, fuzzy fur’. But while others may think his looks disqualify him from any real chance of becoming a police dog, Fizz is determined. It’s clear that he’s not the only dog keen to tryout – there are dogs of all shapes and sizes lining up for the tryouts. Most are friendly, but Amadeus, a big, black, cold-eyed, gang-leader dog, is scathing. Fizz, he says, has less than no chance. One by one, dogs are sent home as they fail the tests. Fizz is undaunted. There are illustrations on every opening, a character spread and a contents page. ‘Fizz The Police Dog Series’ offers four titles about Fizz and his adventures. 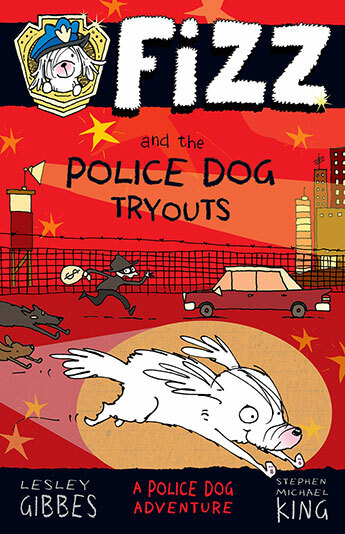 Fizz and the Police Dog Tryouts is Book 1. Each title is in a different colour, and numbers on the spine are complemented by a letter on each title, spelling out the name of the main character. Fizz makes many friends, although not all of them are destined to be police dogs. The character sketches introduce the reader to the dogs and people they will encounter. Titled and numbered chapters also include full page illustrations which hint at the action to come. Fizz may be little, but he’s friendly, smart and determined. Fizz has a lovely supportive family, although his mother, particularly, thinks he really should join the show circuit. Recommended for junior primary independent readers. ‘Whoo-hoo!’ barked Fizz, as he leapt out of bed and raced to his breakfast bowl. Fizz buzzed all over. His dream of becoming a police dog had come true. ‘Did you clean your ears, sugarplum?’ asked Fizz’s mother. ‘Yes, Mum,’ said Fizz, between mouthfuls of food. Fizz is very excited to be beginning his training as an undercover police dog. He may not look like a police dog, but that’s going to be an advantage in undercover work. But first there are detective skills for him and new friend Remi, to master. Only then can they graduate as undercover police dogs. Amadeus, the dog who does look like a police dog, is convinced that Fizz and Remi will fail. There are illustrations on every opening, chapter headings and full page illustrations, a character spread and a contents page. 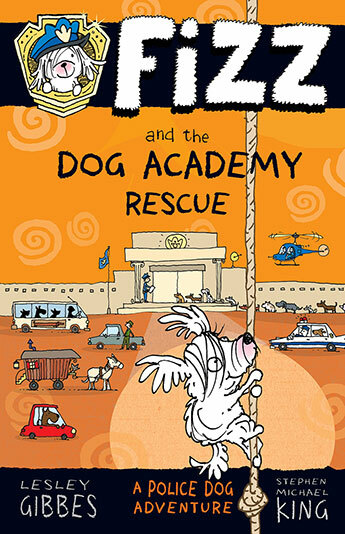 ‘A Police Dog Adventure’ featuring Fizz and friends is a new series of early chapter books from Allen & Unwin. This is Book 2 of four titles so far. In this instalment, Fizz, his friends and his nemesis are at the Academy for training. Amadeus is sure Fizz is a poor chioce as a recruit, but Fizz and his friend Remi are to be undercover police dogs precisely because they are not stereotypically police dogs. Their extra training begins almost immediately when other recruits are being injured and sent home. It’s up to Fizz and Remi to work out what’s going on. Lots of fun and pun for beginner readers. Recommended for newly independent readers ready for first chapter books. But one day they noticed that Mr Pockets was spending a lot of time playing with the kitten. He laughed when she sat on his head. He laughed when she scampered away with his ball of wool. He laughed when she tip-toed around the bath. And he looked contented when she fell asleep on his chest. Biff and Buff love living with Mr Pockets – and riding in the pockets of his very big coat. But when a lost kitten arrives on their doorstep, they are at first concerned and help to look after the kitten. Until they notice how much Mr Pockets loves the kitten, and start to worry that Mr Pockets might neglect them. When clever Mr Pockets realises this, he reassures them, but in the meantime the kitten has run away, and it’s up to the Pocket Dogs to get her to come back. 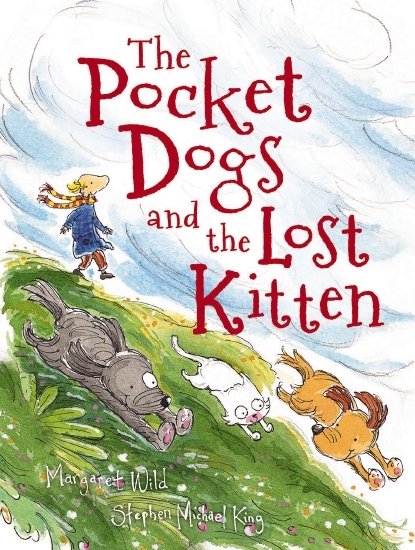 ThePocket Dogs and the Lost Kitten is the third wonderful story featuring the wise and whimsical Mr Pockets and his two adorable canine companions. It is a tale about companionship, and friendship and, of course, the idea that there is no limit on how many people (or animals) a person can love. It could also be used as preparation for the arrival of a new sibling. Mostly, though, it is a joyous book about a man and his animal companions. With the whimsy and quirky detail of the previous books, the illustrations, in ink and pencil, are divine. My dad is a giraffe! When your dad is a giraffe, you can climb up his legs, slide down his neck and ride on his back. He can see a long way, and do amazing things. In My Dad is a Giraffe, Dad is depicted as a giraffe, with the human child loving what Dad can do – and the opening and closing illustrations cleverly showing that Dad is not really a giraffe, but that his imaginative child sees his height and cleverness as giraffe-like. The text is simple, and a perfect complement to the whimsical illustrations which show what a giraffe-dad can get up to, as well as showing Mum as a zebra. Youngsters will love exploring the detail of these illustrations, as well as the message of love and connection between the father and child. 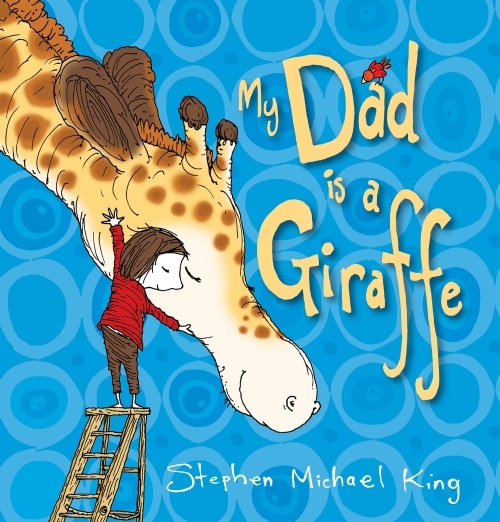 Filled with the gentle, imaginative fun that Stephen Michael King is known for, My Dad is a Giraffe is wonderful.